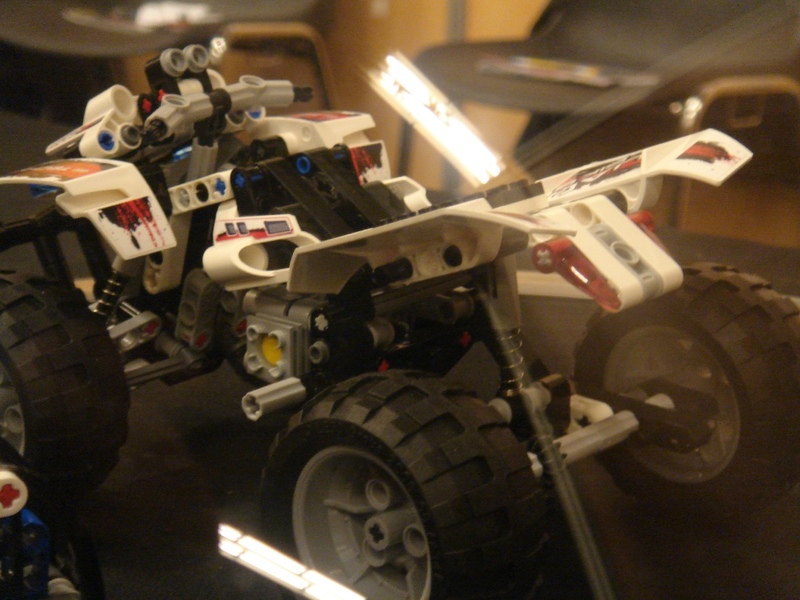 TechnicBRICKs: A new TECHNIC axle to come? Some time ago, Ryan (anonymous) raised a question in the comments to this post, suggsting we may be getting a new 9L TECHNIC axle, coming soon with the new 1H2009 sets. Namely within the new 8261 (Monster Truck). At that time it was no more than a possibility, but an unlikely one, as we wasn't able to get a definite conclusion from the images available. It could be also have been a combination of shorter gray axles (3L+3L). Yesterday, Ryan came to me with a new and very good hint. As you can see from the image below, taken from 'Measurements sheet' on the B-model instructions for the 2H2008 sets, there is a reference to a 9L 'Light Bluish Gray' (LBG) axle. Unfortunately this topic came up again already after I have left LEGOWORLD, so again can't confirm it in front of the real models. Nevertheless some investigation work on the pictures I took there, seems to bring important clues. We already knew that the bent beam under the 8261 seat, is 9 wide at that point (as a trained eye can easily realize from the photo below, on the left). From the photos we still can't be sure there is a 9L axis in there, but we know there is a good chance for it. However the most important evidence cames up, when you look in detail to the axle termination inside the bent beam. The axle termination is obviously not a production part, but one the was broken (bottom right image) from something larger. The strange thing is that we don't have any LBG larger axle to be broken into a smaller 9L axle (maximum actually know available is 7L). Either LEGO TECHNIC Designers have indeed access to such larger LBG axles, or they have used a combination between 3L, 5L or 7L axles and broken one to get the desired length. A similar evidence seems to be found at the new 8262 (Quad-Bike). Again a trained eye, could also recognize a good chance for a 9L axis below the seat on the left image below. 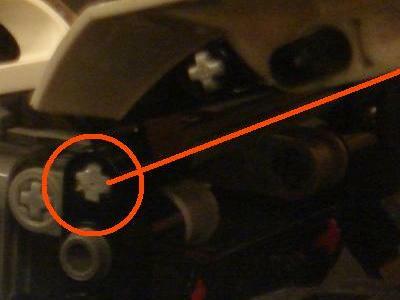 Once more the axle seems to be broken at its side (right image below). 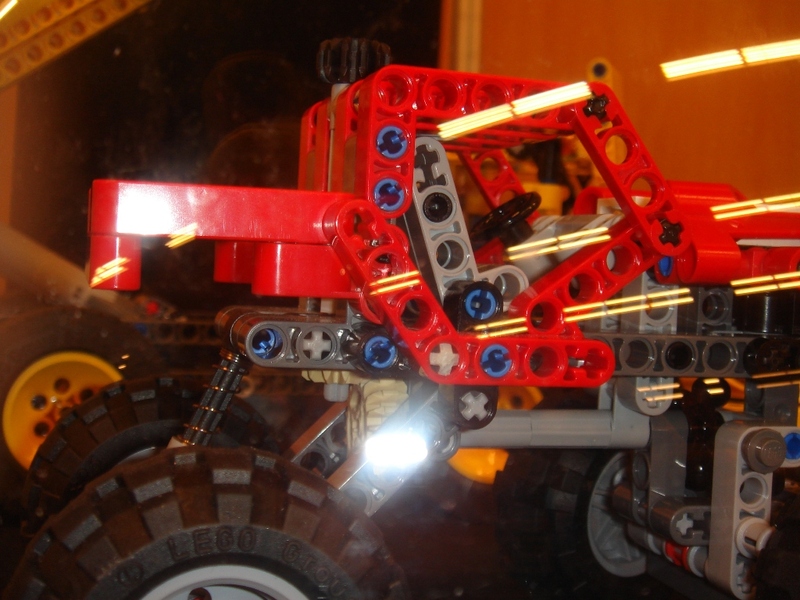 One way or another, if there is really a new 9L axle to come, it was not yet available from the production line, at the time the displayed models at LEGOWORLD were built. The Technic 8421 Mobile Crane has a L32 (about 10 inches) axle in the boom. Maybe they cut one of those. That's possible, but that axle only comes in black... at least on production sets. Just like unusual parts like red trees and transparent motors, perhaps LEGO could access a bigger axle in light grey and cut it. Anyway, it doesn't have to be the axle 32L... since (until now) all production axles bigger than 9L (10L, 12L, 32L) are black, any one of those could have been produced in light grey and chopped. That we know, but never a 'Light Bluish Gray' axle larger than, 7L was included into a LEGO set. 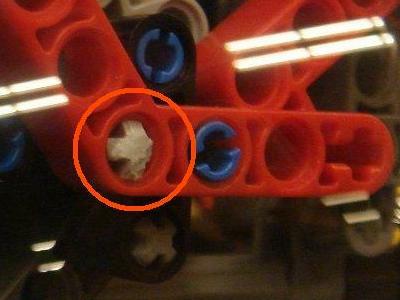 Of course, it doesn't mean LEGO Designers don't have access to such axle. All these have been produced in other colors than Black. However never in LBG (at least in production sets). There is also the 16L axle. Although only in white color. It doesn't take much to put a different plastic in a mold. but why put grey plastic in a larger mold and cut it, when you have a 7 unit mold? The Quad bike does look like a 9! which is good news as I have a need for one! I am reserving judgment on the truck, although the broken end is a positive sign! I suppose the next question is when will there be an 11? I believe the broken part looks to be LBG and not LG, like that from the set in 2000, that you linked to. So it should have been produced more recently. But still don't understand which would be the origin and why they presumably produced larger sizes, instead of the 9L needed. There IS hope for a 9L! I first thought the LBG 9L showing up in the B-model instructions was just an erroneous but natural assumption by the solidworks draft tech at TLG...I mean why wouldnt there be a 9L? (Or as already noted, it exists just not outside TLG). But you guys have me believing. Besides, if it was just a CAD drawing error, why isn't there an 11L axle on that sheet? I don't think there will be an 11 soon, it isn't on the size chart... but what the future may bring?? What?!?!? You mean I'm allowed to break or even cut axles to the length I need. Here I've been waiting all this time for a 4 and a half. I'll just snip the end off a 5! It's true, there is an 9L axle. 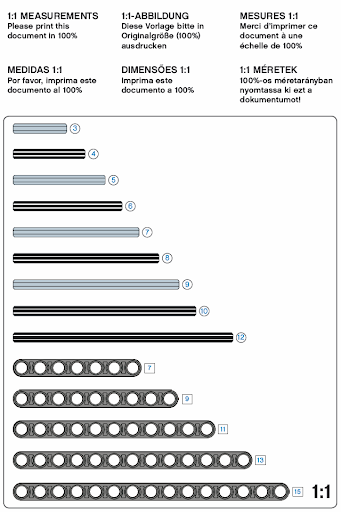 If you check the building instructions on LEGO.com you'll see that in the beginning they use a 5L and a 9L.